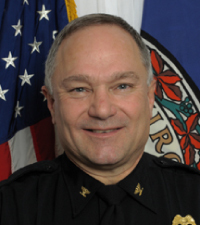 Chief Roche began his career with the City of Harrisonburg in 1976. In 1978, he accepted a position with the Roanoke County Sheriff's Office's Enforcement Division. During his tenure with the Sheriff's Office, he was promoted to the rank of Detective and Platoon Sergeant. He was also appointed the agency's S.W.A.T. Commander. In 1990, the Roanoke County Police Department was formed utilizing the majority of enforcement personnel from the Sheriff's Office. Chief Roche was promoted to the position of Uniform Division Platoon Lieutenant, Criminal Investigation Division Lieutenant, was appointed to supervise the accreditation team which accomplished agency accreditation by CALEA in 1992, appointed by the Chief of Police to organize and establish the agency's Professional Standards Unit, appointed the second in command of the Uniform Division, and ultimately Acting Uniform Division Commander. Chief Roche accepted the position of Chief of Police with the Town of Pulaski in 2001. This agency was accredited by VLEPSC in 2006. Chief Roche received a B.S. degree in the Administration of Justice and Public Safety from Virginia Commonwealth University and a M.S. degree in the Administration of Justice from Radford University. He is a graduate of the F.B.I. National Academy and the Professional Executive Leadership School at the University of Richmond.